Sebacic Oman SAOC celebrated today (Wednesday, 26 October 2016) laying the foundation stone of Sebacic Oman Bio- Refinery for the production of Derivatives of Castor Oil under the patronage of H.E. Yahya bin Said Al-Jabri, Chairman of SEZAD Board of Directors. This Bio-refinery is the first project of its kind in the Middle East to produce Sebacic which is extracted from castor oil and is used in many industries, such as chemicals, plastics, and drugs. It is also used as an intermediate substance in detergents, paints, and perfumes industry. The high economic importance of this product would encourage the establishment of many allied industries in SEZAD. The investment cost of the project is about OMR 24.00 Million in an area of ​​ 400,000 square meters. H.E. Yahya bin Said Al-Jabri indicated that Sebacic Oman Bio- Refinery is a good addition to SEZAD that witnesses a diversity of investments. “We meet today in Duqm to celebrate laying the foundation stone of this vital project, which is a joint investment between the private individual in the Sultanate and India. It expresses SEZAD vision to promote domestic and foreign investments and create successful partnerships between the Omani and foreign companies. Moreover, the funding of the project by Meethaq Islamic Finance emphasizes the role of the banking sector in promoting such partnerships,” stated Al-Jabri in a press statement. 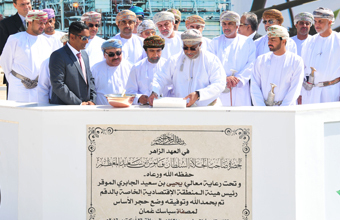 “While expressing our joy today for laying the foundation stone for this project, we invite the local private sector to invest in SEZAD, which offers many facilities and incentives that encourage investment,” SEZAD Chairman said while commending the initiative of Sebacic Oman Company as a First One to set up its project in Duqm. For his part, Sheikh Hilal bin Khalid Al-Mawali, the Chairman of Sebacic Oman SAOC, said that the strategic and historic site of Oman and the noble approach of His Majesty Sultan Qaboos bin Said - may God protect him - has made Oman an oasis of security and stability in the region. “The vision of His Majesty and his continuous call for diversification of income sources and the issuance of his Royal orders for establishment of SEZAD requires all Omanis to exert more effort to establish distinct economic projects based on knowledge and innovation. These should be in line with the huge infrastructure investments by the State in the various economic zones in the Sultanate,” stated Al-Mawali. “The project has a long-term vision aimed at bringing investments from Oman and abroad by establishing industrial facilities next to the petroleum refinery. We are currently discussing the opportunities for a mix blend of products from Petroleum Refinery and Our Bio-Refinery with investors from foreign countries. Our CEO, Mr PradeepKumar Nair has advanced technological capabilities and identified products and Market for this Business Plan, said Al-Mawali in his speech delivered during the ceremony. “The design of Our Bio-refinery relies on a high-tech proven Technology. SEZAD has allocated us ​​400000 square meters for this phase and future expansions. The construction work is proceeding as according to the schedule set and in conjunction with the manufacturing of heavy equipment in many foreign countries. We will qualify and train the Omani nationals to work in the various disciplines in our Bio-refinery,” added Sebacic Oman partner. In his speech, Sheikh Hilal bin Khalid Al-Mawali spoke about the refinery products and target markets. He said that there would be many derivatives of Castor Oil. “We have identified target markets. We also follow a strategic ten-year development plan with investments that exceed OMR 450 Million. This will provide more than 700 jobs,” concluded Sheikh Hilal Al-Mawali.